Big truck companies want to make a profit. Some are safety aware. But many 18 wheelers do not have an ingrained safety philosophy or culture. They care little about you before the crash and even less afterward. So the statement in the photo to the left is more than appropriate as some trucking companies have poor safety ratings but fail to correct known deficiencies. Just recently out west we witnessed a tragedy of multiple deaths my a common carrier of human freight on buses. 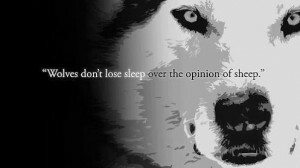 What are you going to do when the wolf comes after you? Maybe not you personally. But I take it personal , as a injury accident lawyer, when a tractor trailor disregards safety, causes a death or deaths or horrible injuries and does little or nothing to try to compensate for the loss or alleviate the problem. With all the computer on board availability the push is for profits and not people. The Federal Motor carrier regulations are supposed to be a shield of safety. But when they are diregarded and cause harm, they can be used as a sword against 18 wheeler operators to push them to do the right thing and make up for your loss. not because they want ot but because the wolf is now at their door. An Ohio personal injury accident lawyer offering free consultations in serious injury and death claims . Call today for his legal help.